For some time now, we have had the idea of getting a bunch of people from the community and hosting a dinner at the end of the Summer. The main idea is to have everyone bring dishes made from scratch and using as many local ingredients as possible. We have been bouncing ideas back and forth and we think that this would be a great way to celebrate our community and the wonderful foods found in Colorado. Since Pikes Peak Community Cupboard is truly a community event, then we will of course rely on the generosity and good will of people to make this happen. 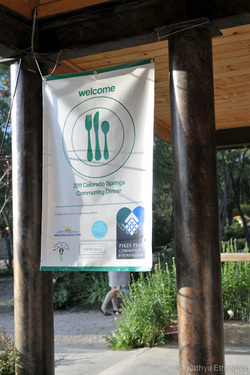 We have scheduled the Community Dinner to align with Colorado Springs Local Food Week which will be September 17-25, 2011. The Community Dinner will be on September 25th, to close out the week and to bid farewell to Summer. We are also excited to announce that the location for the dinner will be at beautiful Hillside Gardens and Nursery; Beer and root beer will be provided by Rocky Mountain Brewery and the J. Miller Band will be performing! The Pikes Peak Community Foundation (PPCF) awarded a $2,000 grant to the Community Dinner! A while ago, we applied for an Ingenuity Grant. From the Foundation's website: "Ingenuity Grants will encourage people to get involved in their community as they plan and execute ingenious, innovative, and/or creative projects that demonstrate significant potential to enhance the quality of life for our citizens. In particular, we encourage projects that generate increased charitable giving in support of these ideas." In their letter to us awarding the grant, they stated, "The committee believes your project demonstrates significant potential to enhance the quality of life for our citizens." We are honored, humbled and grateful for this recognition of what we (with all of your help) are doing. We would like to direct you to the Colorado Springs Community Alliance (CSCA) website to make a donation. The donation charge will be immediate and donations to CSCA will both make funds available to begin ordering/reserving what we need for the dinner. Also, you will be able to track donations at the website. There will be a similar gauge so that you can see what kind of donations are being received. *UPDATE 16 August 2011* We have reached capacity for the Community Dinner, 100/100 seats are now reserved, over a month before the dinner! Thank you to everyone who reserved a seat. We apologize that we're no longer taking RSVPs. As we get closer, there will be emails sent out to everyone who has registered with more information on details about the actual dinner. We are also working on a special gift to give to people who have donated. Thank you so much for your generosity and support. We look forward to an amazing event in September. *Update 26 September* Thank you, thank you all so much again! It was an amazing evening!